The Goethe-Institut Washington offers exciting, free events for school classes. The Goethe-Institut Washington would like to invite you and your students to visit us. We will tailor a program for you and your students related to the German language and culture. Do you want to offer your students a special treat? Invite Germany’s “Young Ambassadors” into your classroom. 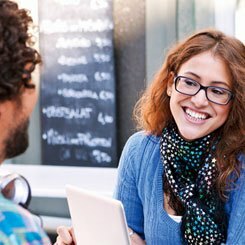 Learn more about German For Hire. In the US, the German Academic Exchange Service (Deutscher Akademischer Austauschdienst - DAAD) has a branch office in New York that can answer your questions about studying in Germany.